Laura Baruch and Kylee Katch were off pursuing their own projects and finding their own styles when they finally decided to join forces - something they’d be wanting to do for quite some time. They started writing together under the moniker Karmic after Katch’s band ended, writing their first song in less than a day. It was clear that they work well together both writing and harmonizing. They’re at the point where sometimes they can’t even tell whose voice is whose when they play back a harmony they’ve recorded. “We were into totally different styles of music so when we finally came together it was awesome to combine both our individual sounds and make one great karmic sound,” Baruch said. 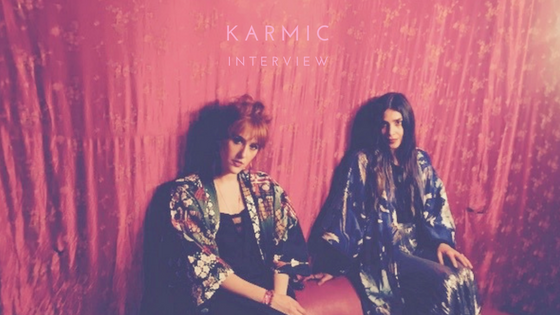 “I think that’s why Karmic has its own personality; because of our separate influences and then we come together and it makes a whole other influence,” Katch adds. The duo works together with producers Samuel Murphy and Peter Kastner of Bad Owl Records who are known for bending sounds and the lines between genres. Each of their backgrounds in the industry adds to the unique collaboration. The ladies live by a quote that Kastner uses frequently - ‘If you want to get somewhere quickly, you go there alone. If you want to go far, go together.’ They really vibe off one another in ways that make them more comfortable about the music they release into the world. Their newest track, “Warriors”, is described as ‘a quintessential female forward pop track that is both inspiring and determined.’ They were originally asked to write an empowering song for an ad campaign in Austria and while they were out on tour, the song came about naturally. It touches on equal rights and encourages women everywhere to stay a part of this fearless movement. The universe indeed aligned for Karmic. As they prepare to release more genre-bending music, they prepare together; never alone.